Additionally, 81 members of the Senate and 513 members of the Chamber of Deputies will also be elected. An investigation into political corruption, known as operation Car Wash, has resulted in accusations and arrests of leaders in multiple political parties. Brazilian voters will go to the polls on 7 October to elect 81 members of the Senate and 513 members of the Chamber of Deputies, as well as cast their vote for a new president. Should a single presidential candidate receive more than 50 percent of the overall vote, he or she will be declared the victor. If the 50 percent threshold is not met by any candidate, a second round of voting will be held on 28 October. There is a general feeling of dissatisfaction among ordinary Brazilians with the country’s current political class; the result of a combination of multiple factors, most notably the high levels of crime in the country, an economic recession and an ongoing political corruption crisis. In 2014, the country entered its most severe recession in its history, which lasted for approximately three years. The same year, judicial authorities launched the anti-corruption ‘Operation Car Wash’ investigation into money laundering among Brazil’s political and business elite, starting with Petrobras, the majority state-owned oil company. Operation Car Wash sparked a variety of investigations into illegal financial practices, leading to the impeachment of former President Dilma Rousseff, her popular social democratic predecessor Luiz Inacio Lula da Silva has also since been jailed in a highly divisive verdict, and the current president, right-wing Michel Temer, is facing an array of corruption allegations. Lula is convicted of accepting bribes and has been accused in other ongoing cases of orchestrating a kickback scheme while in office. The Workers Party had initially registered jailed former President Luiz Inacio Lula da Silva as its presidential candidate. 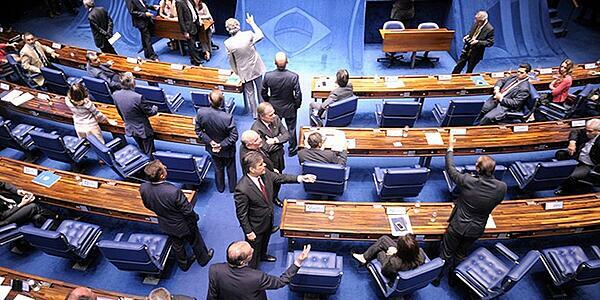 However, on 31 August, Brazil's electoral court voted to bar the ex-president from running in October's election. Due to this decision, and the risk of not being able to field a candidate, the Workers’ Party officially named the former mayor of Sao Paulo, Fernando Haddad, as Lula's replacement on 11 September, with Communist Party legislator Manuela d'Ávila taking Haddad's place as the vice presidential candidate. Prior to being barred from running, Lula easily led all contenders in polls when his name was included, winning the support of 39 percent of those surveyed. Since Lula’s replacement, far-right candidate Jair Bolsonaro, who was stabbed on 6 September in Juiz de Fora, has led in the polls. He is followed in second place by Haddad who has been slowly gaining support. Ciro Gomes of the Democratic Labor Party, Geraldo Alckmin of the Brazilian Social Democratic Party and Marina Silva of the Sustainability Party all follow distantly in the polls. In addition to the poor economic performance and rampant corruption, political leaders appear unable to control ever increasing crime rates in Brazil; especially violent crime. Brazil’s murder rate hit a new high in 2017, with more than 63,000 homicides – a rate of 175 per day. Brazil’s domestic criminal gangs, are also becoming increasingly involved in the international drug trade fuelling crime in country. The attack of a political candidate is virtually unheard of and the incident was the first time in decades that a presidential candidate in Brazil has been the target of an assassination attempt. Recent incidents of violence have largely been restricted to local politics. However, the assassination attempt was the latest incident in an escalating trend of violence against the political elite; in March, a left-wing councilor, Marielle Franco, was assassinated in Rio de Janeiro. Less than two weeks later, former President Lula's campaign bus was shot at in southern Brazil. The election is proving hard to call; the violence directed at politicians echoes a growing frustration among Brazilians with corruption and the political establishment. This has opened the door for extremist populist leaders such as Bolsonaro. Many are now tipping the populist as a dark horse for the presidency. Bolsonaro’s strong stance, especially on crime, is a big factor in his popularity in the polls. His economic policies are also seen as market friendly and positive for Brazil’s stalling economy. However, for most of his political career, Bolsonaro has been deeply criticised for making homophobic and prejudicial remarks. Bolsonaro has also been outspoken in his support for the past military junta and has a general as a running mate. As a result of this, while he may lead in the polls, Bolsonaro is largely expected to lose in a run-off to his closest competitor, Haddad, given how controversial a figure he is. So polarized are views on Bolsonaro, protests against the far-right candidate have been planned throughout the country on 29 September. Elsewhere, Haddad has seen a substantial increase in the polls given that it has been only a few days since his official confirmation. This is largely in part to his endorsement by the barred Lula. However, victory for Haddad would likely lead the country back to left-wing economic policies, with investors fearing the return of a state-led economy with no attempt to continue the economic reforms that would stabilise the country’s growing spending deficit and increasing inflation. As a result, there is a lot of skepticism regarding the presidential elections as the country faces an uphill battle with corruption, violence and an uncertain economy. In late May, cargo drivers and workers of Petrobras conducted a nationwide strike in retaliation of higher gasoline prices. This led to a fuel shortage in the country that affected airports, public transportation hubs, and daily commuters. The effects of the strike led to the resignation of Petrobras CEO and immediate action by the president to lower fuel prices. The election's uncertainty has also dragged Brazilian stocks lower this year as the country’s economy continues to struggle. Unemployment remains in double digits, and public debt has risen sharply to approximately 74 percent of GDP. With uncertainty surrounding the upcoming presidential elections, large demonstrations are likely to unfold in key urban centres of the country. These demonstrations could potentially lead to strikes, blockades, and even violent clashes. Potential civil unrest in areas where Lula Da Silva and the Workers’ Party have favorable support; such as in the north and northeastern parts of the country. An increased threat posed by domestic criminal organizations, such as the Primeiro Comando da Capital, to attempt to disturb the electoral process. Stringent security measures, particularly in major cities, during campaign events and at polling stations; these measures are likely to include an increased and highly visible security forces deployment, additional identification checks, vehicle checkpoints and the possibility of travel restrictions on certain days. Further economic turbulence is expected which has the potential to trigger another recession. Avoid demonstrations and large gatherings. Even events which look peaceful can quickly turn violent with little to no warning. Monitor local and national new outlets. Expect an increased police and military presence at key voting centres. Follow the instructions of the authorities at all times. Prepare for possible travel disruption due to heightened security measures. This could include road closures in the vicinity of the gatherings. Review your personal travel and security plans, particularly with regard to accommodation location and journey management on election days.